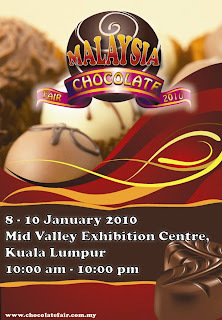 You are invited to visit Malaysia 1st Chocolate Fair 2010. Schedule from the 8 – 10 January 2010 at the Mid Valley Exhibition Centre, the fair is open from 11.00am to 9.00pm daily. Lots and lots of chocolates to be won! Delicious sampling of both local and imported chocolates. You will find chocolates from Russia, Switzerland, Australia, Germany, Austria, Iran, Belgium, US and of course, Malaysia. Activities includes chocolate making demonstrations by renowned French chef, quizzes, chocolate appreciation open to ALL VISITORS. p/s : wahhh.. kenkawan yg pegi, tempek ler gambar sikit.. leh mengubat ati yg xdpt nk pg ni..